We are on our way to Roma, home of the largest cattle sales in Australia. The roadsides here are dotted with white fluffy cotton buds. Cotton is cropped in the area and seedlings are breaking out of the paddocks to mix with grasses, gums and prickly pears. A flock of bright lime green and red parrots swoops around us as the utes roll on. Bright yellow sunflowers, more escapees from horticulture, nod as we go by. It’s a fine day in colourful Queensland. Layers are stripped off as we moult our winter woollies. Some go straight to shorts and tshirts while the more cautious start with slightly shorter 3/4 pants. I blink and wipe my eyes. No, it can’t be, that looks like a flock of bright yellow sheep. Sure enough, here are more newly shorn sheep, happily grazing, oblivious of their lurid hue. Yellow dyes have been added to their dip to mark out those who have been protected from ticks, lice and other parasites. Any that have missed the dip can be easily spotted by the farmer. It’s logical, but it gives the view a surreal flavour as if we are waking from a morphine dream. We are soon at St George and ready for morning cuppas. St George is a gracious patrician town, wide roads, well maintained buildings, a John Deere franchise and a river frontage. We can’t stop long to discover more this time. It’s on to Roma and the cattle sales. Even the scrub looks like parkland here. Red red earth, grey green grassland dotted with trees. Well nourished cattle wander in the shade. We hope for a sighting of Major Mitchell’s cockatoo, a pink and yellow bird with a magnificent crest, named for Major Mitchell who explored this area in 1846. In pictures he looks a rare beauty, (the bird, not the major) but he has not shown himself to us yet. Lunch is at Surat. 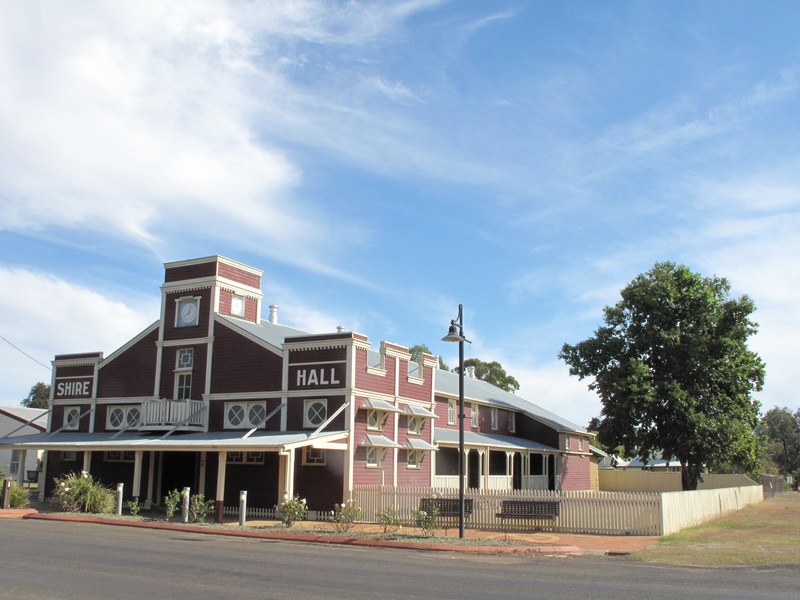 An historic town on the Balonne river. 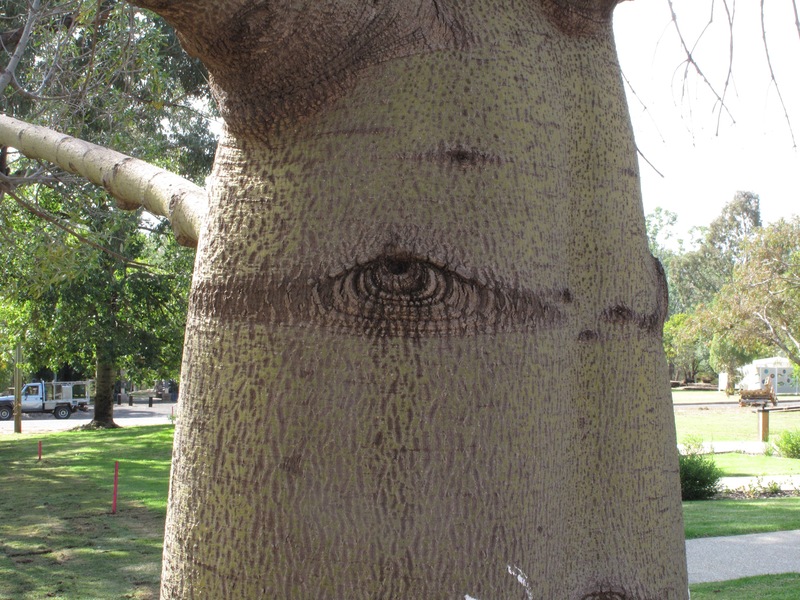 Bottle trees line the street, one appears to look back at us, the shape of an eye drawn in the markings in its bark. We admire the old timber buildings in Queenslander style, a post office, the magnificent old shire hall and a Cobb & Co changing station. Inside a free museum on the Main Street there are old wool industry artefacts and the star of the show, a restored Cobb & Co carriage. What must it have been like to speed down these roads in this wooden carriage, harnessing the power of seven horses, bouncing on the leather springs? No glass in the windows, no air conditioning to block out the climate, dust and scents of the outback. These days it’s diesel-powered cattle trucks and road trains that drive through Surat’s Main Street. We drive on. It’s not far from Surat to Roma. We soon see the signs for the cattle market and pull in to the sale yard car park. This entry was posted in Australia, Outback, roma, travel and tagged Australia, Outback, roma, surat, Travel on 28/05/2015 by Deb McSephney.